Let me help you fight for justice. Distracted driving is a dangerous practice that has caused far too many injuries and deaths on Texas roads and throughout the U.S. 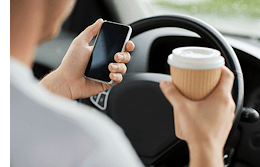 If you or someone close to you has been injured by a distracted driver in Dallas-Fort Worth, elsewhere in Texas or anywhere in the nation, the Glenn Law Firm is here to stand up for your rights. Attorney David Glenn has the experience to handle complex personal injury claims involving distracted driving and other forms of negligence. He has obtained millions of dollars in verdicts and settlements for clients throughout Texas. The dangers of texting while driving are obvious, and many Texas cities have enacted laws banning the practice. Nonetheless, careless drivers continue to text while driving, putting innocent lives at risk. For the injured, a driver sending or receiving a single text message can result in a lifetime of hardship. David Glenn understands the pain and anger felt by victims of distracted driving accidents and their loved ones. He will apply his skill and experience to help you pursue maximum compensation for your medical bills, wage loss, pain and suffering, and other hardships. If you suffered an injury due to the carelessness of a distracted driver, our law firm is here for you. Call us today at 817-424-5999 or contact us online to arrange a free consultation with a knowledgeable Dallas-Fort Worth distracted driving accident lawyer.